Many of us love the experience of creating photos but have a habit of stockpiling those photos on a mishmash of drives and cloud storage, where they remain unseen by ourselves or anyone else. Sometimes guilty of this myself, I long ago stopped printing my work. With web-based portfolios, social media, cloud file delivery, and all my customers and audience online, why bother? Over time, I got rid of all my printers, outsourced everything and generally avoided anything to do with putting ink on paper. I’m sure I am not alone in this. How many of you out there haven’t printed anything in a long time, or have never printed anything at all? Recently, I had the opportunity to select one of my favorite photos, and have a print made of it by ArtisanHD using TruLife Acrylic for a face mounted print. When the piece arrived and I opened the box, it all came flooding back. Just how cool it is to see your work big hanging on the wall. This wasn’t about ego, it was about seeing the product of my creativity and effort, reliving the memory of making that image, and rediscovering just how much I love photography. In this article, I’ll explain how printing your work can make you a better photographer, through my experience of having a large print made of one of my favorite photos. My TruLife Face Mounted Acrylic Photographic Print produced by ArtisanHD. A snowy sunrise over the Rocky Mountains, the color just went on forever, turning this winter landscape into a dreamscape. Until you see your work big on the wall or screen, you may not be aware of technical issues with an image that is not as obvious at typical website sizes. While it is not a great habit to nitpick every pixel in your piece, issues like noise, sharpness, chromatic aberration, etc., all become more obvious in print. There are also some concepts you will probably only learn when preparing a print, like optimizing sharpness and color for different sizes of output, soft proofing, using ICC profiles, and more. Beyond the technical, it also gives you a different appreciation for the impact of your work. 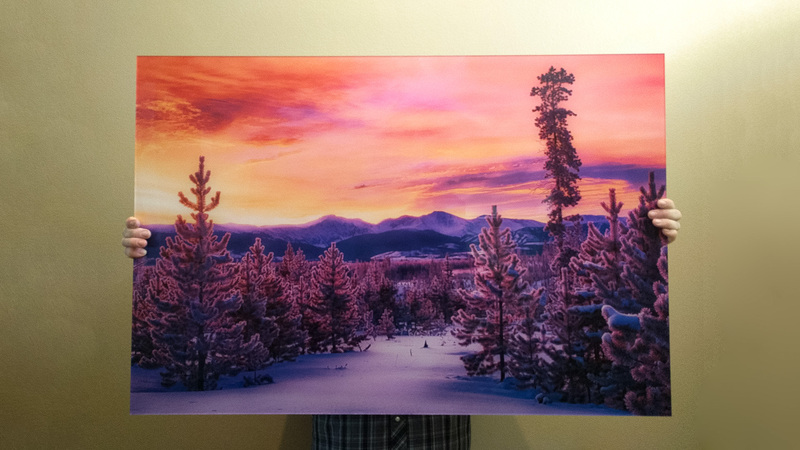 At best, on your computer monitor (unless you are using a huge display), you will never see your print this large all at one time. Viewing at 100% will only show you part of the screen, never giving you the chance to take all your work in as one cohesive whole. Printing your work gives you new ideas as you begin to use wall space, aspect ratios (height to width ratio of an image), and different display techniques as part of your creative process. How about a vertical panoramic photo of a waterfall to fit a long narrow space on a wall? How about organizing a group of photos together to achieve an effect? Using different framing or mounting materials to complement or accentuate certain elements of the photo? When you also think about displaying your work, you include these creative concepts in the image creation process behind the camera, not just as an afterthought in the digital darkroom. One of my core beliefs about photography and art, in general, is the first and only person you have to make happy with your art is you. But, there’s more to that thought, as photography is as much about sharing as it’s about creating. When your photography has the power to make others feel something, that’s the true measure of whether you were able to communicate your creative vision through your work. The ultimate compliment is when someone hangs your work on their wall and makes it a part of their world. Seeing your work large gives you the sense of accomplishment, of “I made that!”. By sharing your photography this way, you also share a piece of yourself. It’s a huge compliment when your work is placed on someone else’s wall because they liked it so much they wanted it to be a part of their everyday world.